There are 4 brand new characters in the second installment of the Merry Chrissy series. Today, I will introduce Ava to the world. 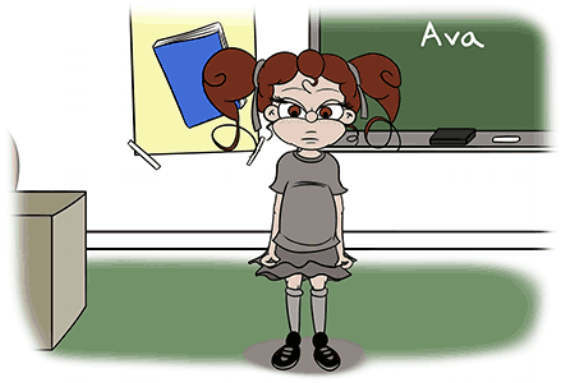 Ava is a new student that suddenly enrolls in Chrissy's elementary school without warning. Initially, Chrissy and Tyler try to figure her out. With a emotionless face, she is somewhat aloof and introverted; Always glued to her tablet. She doesn't even start any conversation or display a single emotion when she's teased at by her classmates. Chrissy tries her hardest to be friendly with her, but she never appears to want to talk...until all of a sudden she starts warming up to Chrissy and Tyler; talking about mundane school things. Not much of a hugger it seems. As the story progresses, Ava becomes a bit more suspicious about Chrissy. Why is she so fascinated with Christmas? Why does she need to be away so much on the weekends? A Christmas "conspiracy" website that Ava frequents seems to ask a lot about what's really going on the the North Pole? Could she be on to something? Ava on the outside is just a normal kid, but the inside is another story. She's a lot smarter than most people take for granted. A perfect contrast from Chrissy's silliness and happy-go-luckiness, she is all truth and logic. Once the reader advances chapter by chapter, you'll really begin to find out what Ava truly is all about. Charlotte Marigold is Chrissy’s main antagonist throughout the majority of the book. She is mostly self centered, conceited and always scheming. A classic bully, Charlotte and her 2 other friends Gabriella and Raven talk behind Chrissy’s back, tease and intimidate her. Charlotte is considered the “queen bully” in Chrissy school and many other kids don't like her as well. From left to right. Raven, Charlotte and Gabriella. "The trio" of friends that bully Chrissy. During the process of writing, I knew early on Chrissy would be challenged by another classmate. I originally thought of making just about everyone in class and school hate her, but that was just too much and too cruel. Instead, the teachers, ever so aware of bullying are looking to punish the punished rather than just the punisher. Charlotte early on was developed as I continued writing. She really has no positive qualities whatsoever, but there is a small hint of humanity in her dark heart. Charlotte mainly teases Chrissy for her year-round interests in Christmas and the style of clothing she wears. Charlotte in all of her purple majesty. There is a big contrast between the design of the two girls. Chrissy is dressed like she came out of the thrift shop. Charlotte on the other hand, came out of a boutique shop. Charlotte and her parents are much more wealthy than the average kid in her elementary class, so it was important that her wardrobe stood out. Going with a royalty theme, I chose many shades of purples and yellows for her outfit. Coloring her was quite a challenge since she has so many different colors. She also has blush on her face in a certain tone. As a personal touch, it’s kinda fitting that her color scheme just about matches the NBA’s Los Angeles Lakers, a team I really hate as I’m an Orlando Magic fan (Still bitter about the Finals back in 2009!) In case you don’t follow sportsball, they’re a highly successful basketball team that won 15 championships. The team that I root for, the Magic have zero. Speaking of sports, the two become fierce rivals. They face off in Dodgeball and a costume contest…and other situations that you'll need to read to find out more!